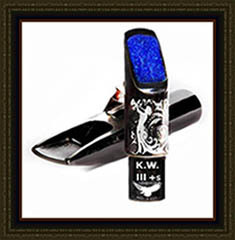 ﻿The NEW Sugal KW III + s HARD RUBBER tenor mouthpiece offers outstanding tonality edge and projection that is very similar to the pure copper metal version at a fraction of the cost. 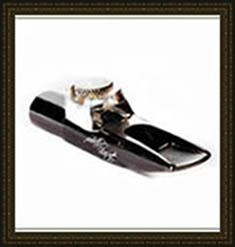 Gary Sugal has been manufacturing high tech metal CNC saxophone mouthpieces for more than thirty three years. After extensive research over the past three years Gary Sugal in cooperation with a leading german manufacturer of hard rubber has formulated a vulcanized-cured proprietary hard rubber rod (bar -stock)that is free of sulfur,mercury, formaldehyde ﻿ and carsnogenic ﻿cynide. 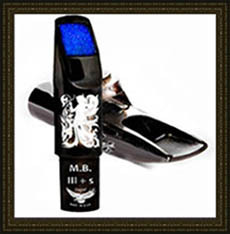 The material is “food safe” and ideally suitable to be machined into a professional saxophone mouthpiece . 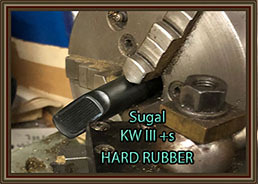 The Sugal KW III + s HARD RUBBER is available in a high gloss traditional obsidian black hard rubber proprietary formulation. Ideally suited for the contemporary jazz musician seeking to have a projected, fat centered sound. Tonality is crystal clear free of any nasal or harsh over tones. All “colors” project a sweet sensual “delightful” tone. 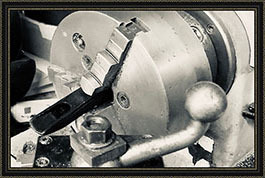 Similar in sound to Sugal's high tech CNC copper versions of the KW II and KW III the HR KW III +s can be purchased for a substantially lower price. Sugal’s machined “snow –hill” baffle is unique to the industry and offers outstanding projection when called upon. Each piece is meticulously hand crafted by Gary. 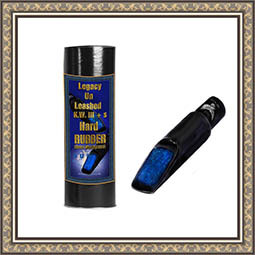 Perfectly designed to a players embouchure and comfortable in the mouth. 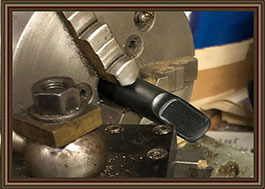 Gary Sugal has been designing high tech CNC saxophone mouthpieces for over thrifty three years and is regarded as one of the finest mouthpiece designers,re-facers and craftsmen in the industry. Proprietary Hard Rubber : Produced from a unique formulation of german hard rubber that is sulfur, mercury, formaldehyde, and cynide﻿ free. COMPUTER DESIGN w/ 3 D SCANNED IMAGING: This model incorporates both the inside and outside geometry of our KW II+s, KW III +s metal versions, offering amazing tonality, projection, edge out perfoming every other hard rubber mouthpiece in the market. PACKAGED and Delivered in a protective tube style case. Bite Pad: A three part acrylic bite plate is cured and set at the factory with a lifetime time guarantee not to break or fall out. Ligature: A conventional two screw ligature and cap provided. A optional built on ligature is available as an option.